Chameleons are amazing creatures. And not just because they appear in a hit ’80s song or humorous word-nerd send-up. No, chameleons are amazing for three distinct reasons. And each relates (in its own small way) to business. 1. Chameleons adapt to changes surrounding them. While the common belief that chameleons change colors in order to blend in with their environment is not true, chameleons do change color based on temperature, light, and mood. As a chameleon grows warmer, for example, its colors become brighter and more distinct. 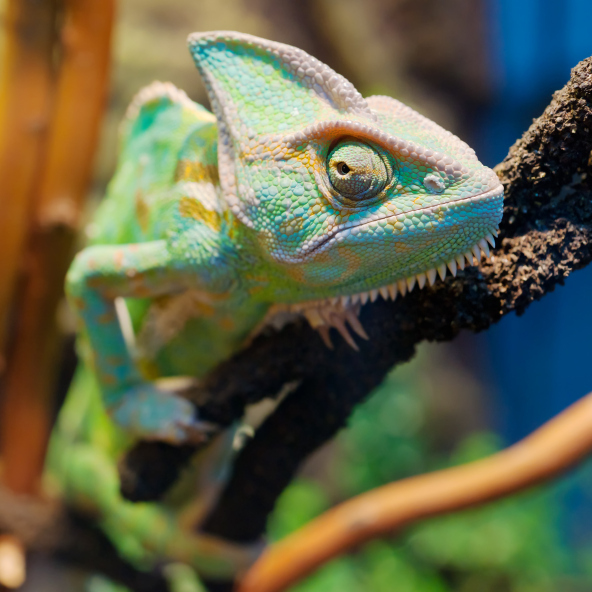 Business application: Like the chameleon, we, too, need to adapt to changes affecting us. As the competition turns up the heat, we need to let our true colors shine through, so we can stand out from the crowd. 2. Chameleons can focus on two things at once. A chameleon’s eyes move independently of one another, allowing it the peculiar ability to watch two things simultaneously… without moving its head. What’s more, each eye has a horizontal radius of 180 degrees and vertical radius of 90 degrees, and can see in three dimensions. Business application: While a singular focus can have its advantages in certain situations, being too focused on only one option (tunnel vision) can sometimes make us overlook opportunities or obstacles in our way. 3. Chameleons strike quickly and with pinpoint control. A chameleon’s sticky tongue is a marvelous thing. Roughly the length of the creature’s body and tail combined, it can extend and retract in just a fraction of a second, with deadly accuracy and control. This entry was posted in Marketing on November 18, 2011 by Nick Dillard.